And I am back! I was gone for a long time because of the final exams… I swear this is the hardest part of teaching high school kids! 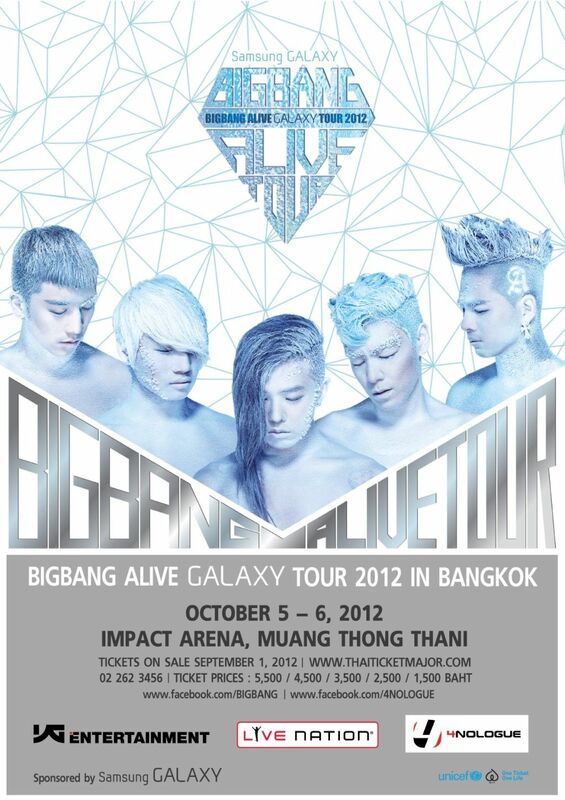 After checking endless papers and making lots and lots of grades, I rewarded myself with watching a concert in Bangkok. 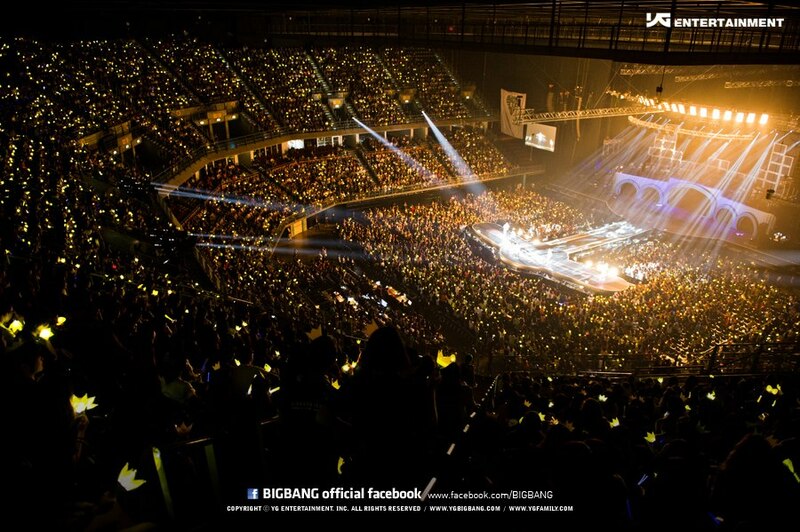 And I’m so glad it was Big Bang’s Alive Galaxy Tour 2012! The security of the concert was quite strict. No food and drinks allowed. If you bought food (like we did) you had to through it away. Also, no cameras or recording devices were allowed. You could only bring your mobile phones. This was indicated in the ticket. I did not think they would be that strict, but they were. I saw a lot of fan girls sad when they were told to leave their cameras. And just to give you an example of how strict YG is when they say no cameras, the girl sitting in front of me tried to take a picture, but she was warned with laser lights pointed directly at her. She only used her iPhone by the way. So don’t attempt to do so.. you’ve been warned! The concert was a BLAST! OMG! Like it was really really nice! It lasted for almost 3 hours and I can’t remember a time when i felt tired. It was very well planned. All throughout it I was shouting at the top of my lungs (and two days later, I still don’t have my voice back :(). If you are a fan of the YG dancers, you would be happy to see them. I only see them on broadcasts and don’t really pay much attention to them, but on stage they were very good too! Also, a band was playing their songs live! During the encore part, they played like 3-4 more songs and the band could play it well. That was the best encore stage so far that I saw! Taeyang was amazing during the concert (well he is my biased). But for this concert, he was the one doing the MC-ing part. I guess maybe because he can speak English. Him and G-Dragon were the ones talking in English to the fans most of the time. 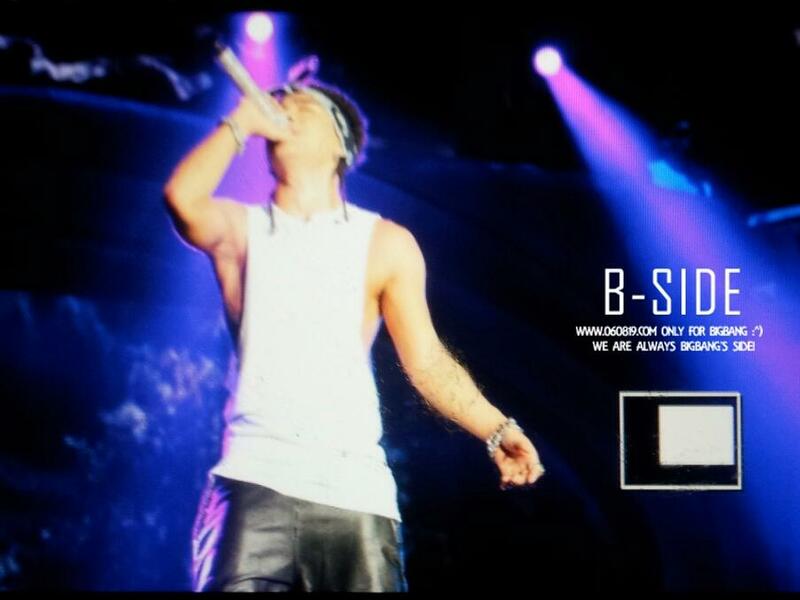 Taeyang is amazing on stage he owned it. Actually him and GD. GD though is a bit more playful on stage and it was so much fun watching him. 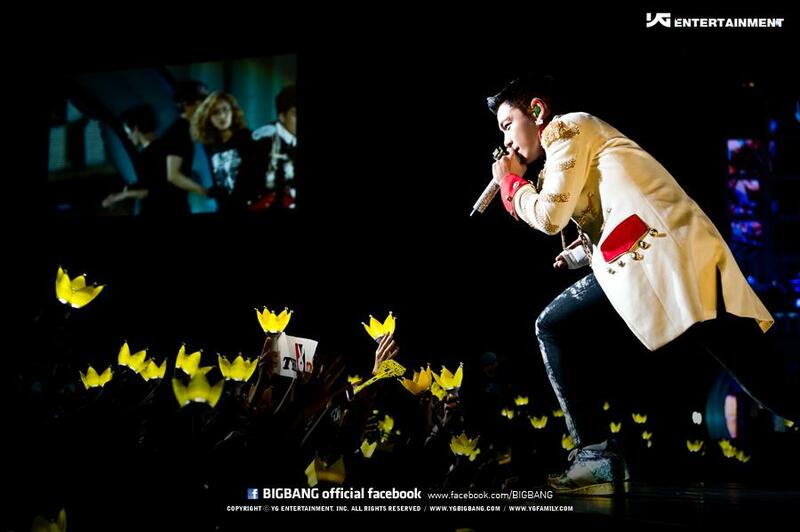 Taeyang is the best dancer among them definitely and a performer. I’m sure those who have biases with him will be pleased and will be on cloud nine after watching this concert. I know I was! My only regret is he did not sing I need a girl. 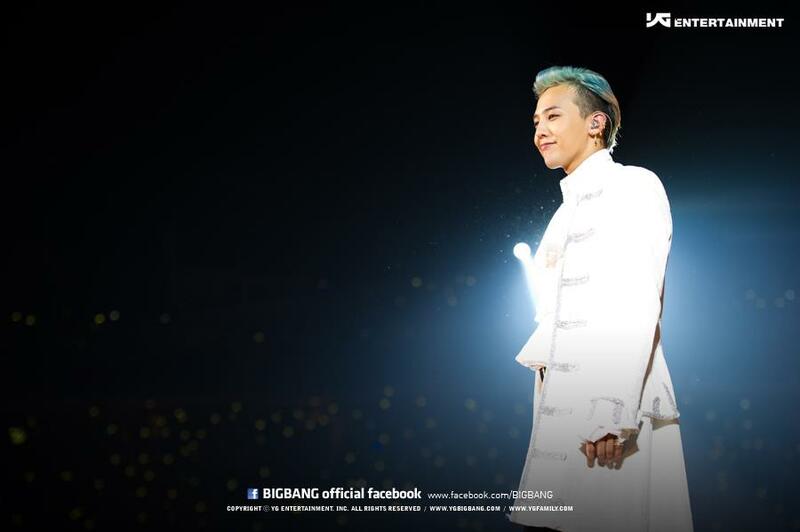 But it’s ok. GD is a performer no doubt! He knows how to please his fans. And though, it was not part of the song list, he performed a bit of One of Kind with the other boys beat boxing in the background. It was so sad because TOP hurt his hands. I felt sorry because he could only hold the mic with one had, but nevertheless he still performed quite well. If you think he is charming on videos, you will find him more handsome on stage. He has an aura of being attractive. Could-not-explain-it-here-so-you-should-see-him-in-person!!! Daesung! Oh Daesung, as usual is the funniest member of the group. Though he spoke mostly in Korean but he was the one who made the jokes and the Thai impersonations. 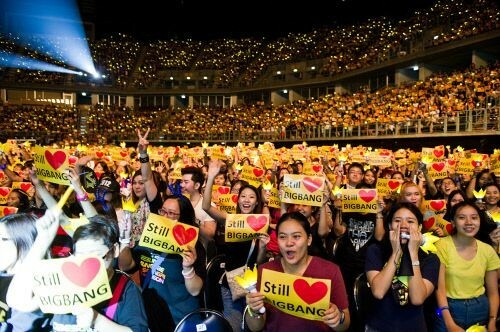 The Thai VIPs loved it of course! And his voice is better heard live. He has one of the strongest voice in Kpop i think. 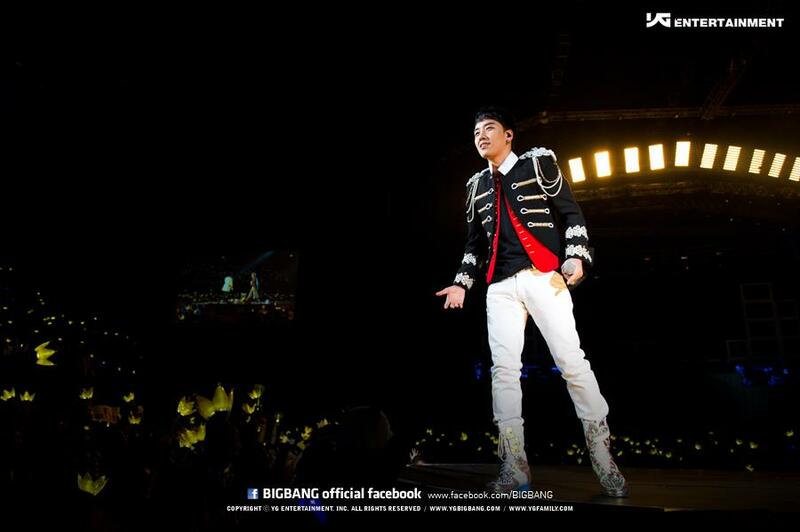 And then there is Seungri, who I will remember for doing the Gangnam Style dance! My friend likes him a lot so till now I could hear her screams! 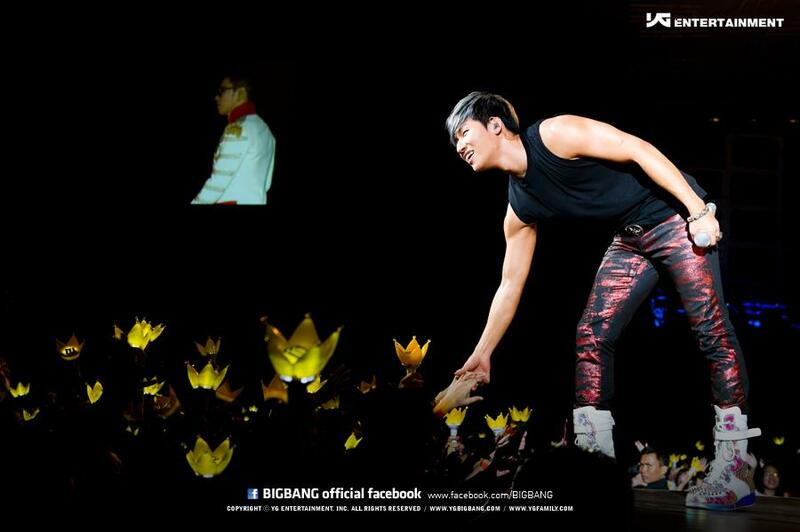 But I think Seungri is the member who approached the fans the most. And as a maknae, he also is a bit mischievous on stage! But he is funny too! To best experience this concert, it recommend you have the crown light stick. (It was sold here for 800 baht, but I’m not sure how much it would in your place). It’s not complete if you don’t wave it with the music. But warning, your arms will hurt because you can’t put it down! I didn’t want the concert to end!!! Maximizing my free time tonight! Posting as much as I can! This time it’s Big Bang’s Monster. I really like watching Big Bang videos because of how unique the concepts and their interpretation of the songs are. Every time I watch it it’s as if I grasp the meaning of the song even though I haven’t seen the translations. This video, as scary as some may say it is, is once again another manifestation of those unique concept but you understand their message. Whoever is in charge of conceptualizing this video deserves a lot of credit! I think they can work for a large multinational advertising company with all their concepts! Big Bang looks scary in the video, but that’s the point, they are supposed to look like a monster but they are telling you that though I look bad on the outside, on the inside I am not. Kind of like the concept of the Beast from Beauty and the Beast. Applause for the make up! Though I like seeing these boys in their normal/fashionable clothes, I didn’t cringe at the sight of them being a monster! And OMG! TOP.. I think I just dropped dead when I saw this MV! He is so damn handsome in this video! Kyaa! This video was released almost the same time as Wonder Girl’s Like This. Personally, I like this because of the concept and because I didn’t get too dizzy with it. I don’t really go gaga over Big Bang like I do with Super Junior, but I do like them, don’t get me wrong. But what I especially like about Big Bang as an artist compared to other idol groups is their ability to make music and fit a wide variety of musical genres and always give a good result. I have been listening to their song since I became a Kpop fan. At one point I was getting bored with their songs because it all sounded the same. But recently, I love that they are not afraid to experiment with music. When you hear their songs, it has the distinct Big Bang sound but it’s different from what they released before. In the past, I could not imagine Big Bang would do a song like this and pull it off. But hearing this song made me understand how versatile they are as an artist. Props to Big Bang for that. I absolutely love listening to this song! Final Verdict: An artistic MV paired with a good song. Although you can’t understand Korean, you can fully understand the song through the MV. 2011 Big Bang Big Show Clips! Wohoo!!! Now time for Big Bang.. I knew they were doing a parody of Secret Garden and I am anticipating it… Click on the link to see it with the subs! I’m not embedding the video’s though, because it might be removed from yt. So just click on the link. I was waiting to get home from work to post this! kk OMG!! sorry I couldn’t contain myself! It’s Big Bang‘s new song Tonight. Can I shout! I feel like a fan girl all over again. And yes, the V.I.Ps have waited a long time for their new Korean single and I have to say it was worth the wait!! I am very pleased with the new song, because it sounds different and the concept is different. 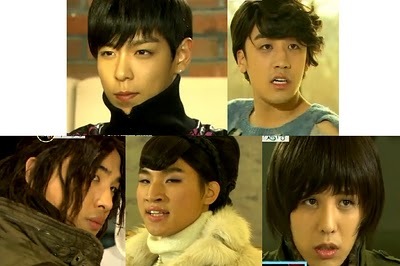 I’m very happy to see this side of Big Bang. I used to get bored with their old songs because most of them sounded the same. This song however, shows the new side of the boys, one that we have not seen before. They used to just have the hip hop vibe, but this is an upgrade of their old songs. I think it’s about time they up the level of their image! (not that I didn’t like the old one… it was fine, but they can’t stay that way forever!). 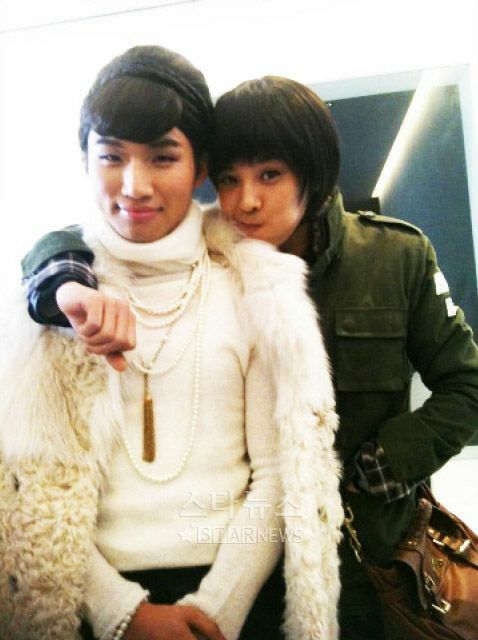 The video is also different, when in the past it was usually G Dragon who had the girl, but this time is Daesung! I like it… I had to make sure it was him when I saw the video for the first time. He looks better in with this concept! Now people are noticing him. I really like his voice and he is really funny on variety shows. I think he should be given more attention because he is pretty talented (but Taeyang would always be my bias). 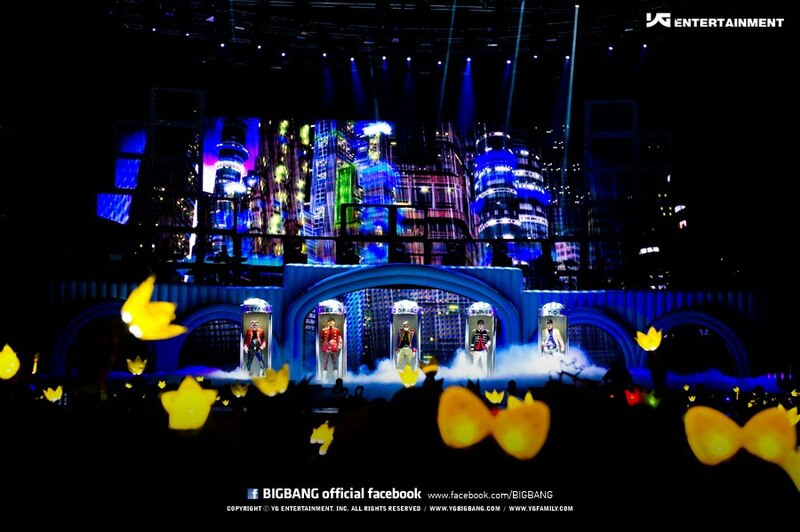 And here is their performance of Tonight on The Big Bang show which was featured on SBS yesterday! So elated about their come back! Taeyang!! Taeyang!!! fan girl screams!!! They’ve release 2 teasers… I can’t wait for the MV!!! I need to stop being so excited and try to get some sleep!! !